We have a fleet of bulk trailers, the oldest of which is 2006. These trailers are all TASCC approved to carry feed products. 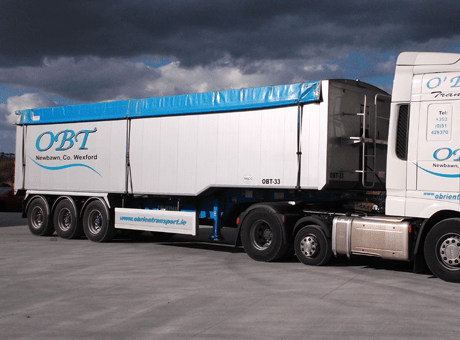 O’Brien Transport currently have one of the largest fleets of bulk trailers in Ireland. This allows us to offer a fast reliable service throughout Ireland and the UK. Our fleet of trailers allows us to deal with one off jobs to large contracts. All our bulk trailers are capable of carrying from 65 to 71 cubic meters.